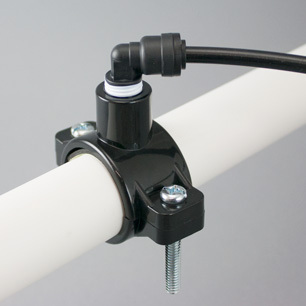 The purpose of the drain saddle is to provide a drain connection for the RO unit. Water can then flow from the unit's drain line, into the metal or plastic drainpipe under the sink. First, choose a place to install the drain saddle, above the J or P trap in the drainpipe. It can be installed on either a horizontal or vertical pipe, although a horizontal pipe is better because it assures noise-free performance. When you've selected the spot, drill a 1/4" or slightly smaller hole in the drainpipe. On horizontal pipes, drill into the top half of the pipe. Next, attach the saddle around the pipe with the bolts provided so that water can flow through the fitting into the hole you've drilled. Tip: The elbow fitting can be removed to make it easier to position the saddle directly over the hole; just reinstall the fitting after the saddle has been tightened onto the pipe. Point the fitting toward the RO unit.